With podcast advertising, marketers aren’t given the hard and fast metrics to measure success we’ve come to expect. There is no clear way of knowing which podcasts will yield the best results. And, we can’t track response. We’re asking listeners to engage with our brand outside of the traditional digital landscape. We have to measure their response to an auditory input. There is no direct way to do that. Let’s dig deeper into those metrics. Downloads are based on the number of unique downloads each episode receives to a computer, tablet, or a mobile device. This information is readily available to podcast hosts, and it is also the metric they use when determining podcast CPM rates. However, this metric is not stable. As the podcast grows, the number of downloads grow with it. To ensure that sponsors get what they pay for, podcast hosts take their average number of downloads and round that number down. Because of this, their estimate will always be lower than the final download count. To get the “true” number of downloads, be sure to follow up with the podcast host 30 to 60 days after the sponsored episode airs. You may be surprised by the difference between the actual download count and the original prediction. From our experience, the download count tends to be much higher. Podcasts with a high download count don’t always result in the best ROI and the number of downloads a podcast receives shouldn’t be the only factor you evaluate when picking a podcast to sponsor. If your product or service fits into a particular niche, you’re better off sponsoring a smaller podcast that is more in line with your offerings. Most of the traffic will come from podcast listeners who search for your company after hearing the on-air ad read. If you’re tracking your efforts with Google Analytics (GA), you’ll likely see a spike in your direct traffic. If the podcast includes their sponsors in the show notes, (a roundup of the key episode takeaways published on the podcast website), you may also see an uptick in your referral traffic from inbound links. To measure the effectiveness of the podcast ad, you’ll need to set up the right tracking. 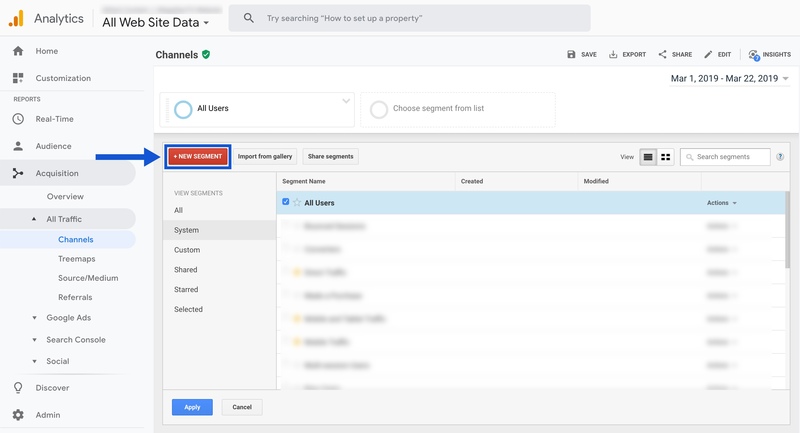 Below is a set of instructions for setting up a segmentation in Google Analytics. Make sure to create a new segment for each podcast that you’re sponsoring. 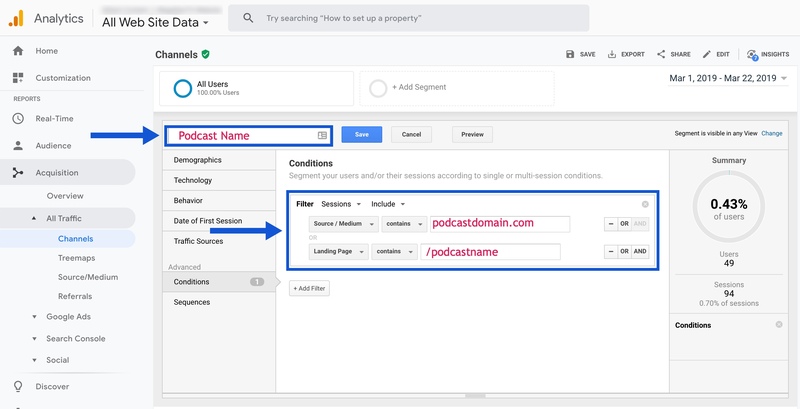 Name your segment using the name of the podcast, then add filters (e.g., podcast domain, landing page you’re promoting in the on-air mention). 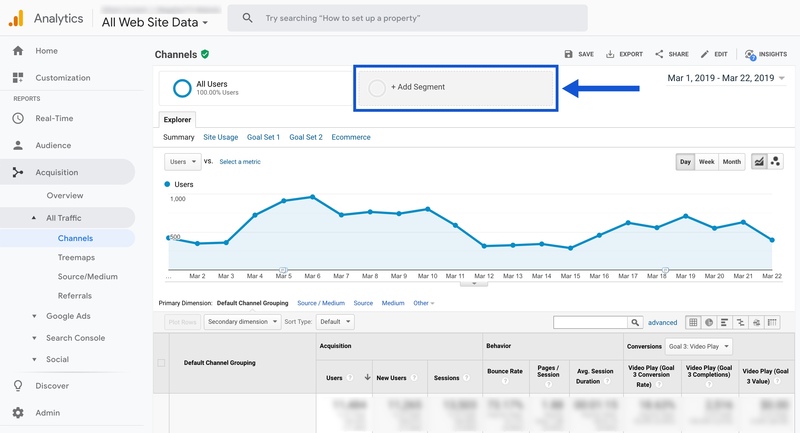 Monitor the segments you created by filtering your traffic down to Source/Medium OR by simply applying the segments to the All Traffic view in GA.
Make sure your data range is set for the time frame when the first podcast sponsorship has aired. To better account for the increase in your direct traffic, create a dedicated ‘welcome’ landing page and ask the hosts to send their listeners there. For example, if Portent were to sponsor a podcast, we’d create a welcome landing page with a URL that looks something like this: www.portent.com/nameofpodcast. Offer codes, trials, and discount incentives are the most straightforward ways to measure the success of your podcast advertising efforts. Exclusive offer codes can be read on-air by the host, included in the show notes, or shared in the body of the ‘welcome’ landing page. We recommend sharing the offer code on the ‘welcome’ landing page. As mentioned earlier, sending listeners to this landing page will help you gain a better understanding of the uptake in your direct traffic. However, if you’re not planning to create custom a ‘welcome’ landing page, ask your hosts to read the promo code on-air. When going this route, ask the host to give their listeners instructions on how to use the promo code (e.g., go to domain.com and enter the offer code at checkout). If you haven’t offered incentives in the past, consider creating a service trial offer, giving 15-20% off a product, or offering free shipping. Regardless of what you choose, make sure that the offer is customized for each podcast that you sponsor. This way, you don’t have to make any assumptions or set up additional tracking to see what podcasts have driven the most signups. Create a discount or trial offer unique to the podcast advertising initiative. Don’t use offers that already exists on the site. You want the offer to feel exclusive and unique to podcast listeners. Bounce rate is the rate at which a user leaves the landing page without browsing any further. This metric is given as a percentage, with a higher percentage meaning high bounce rate and a lower percentage indicating a low bounce rate. Depending on the action you want the user to take on the landing page, a high bounce rate may not be a bad thing. However, if users are bouncing within seconds of arriving on that page, you know that the page is not meeting their expectations. In GA, the time on site is tracked as the Average Session Duration. It’s the amount of time the user spends on your site during the duration of their visit. Time on site can help you gauge podcast listeners’ interest in your product or service. If time on site appears to be high compared to other channels, then this tells you that the listeners are engaged. The average pages per visit metric is the number of different pages the user looks through during their visit. The more content users consume on your site, the more interested they are in your offerings. When examining user engagement metrics, remember the Gestalt principle: “the whole is greater than the sum of its parts.” In other words, don’t over think the performance of individual metric, focus on the performance of all metrics as a whole. While podcast advertising isn’t a new phenomenon, podcast analytics are currently at an infancy stage. If you want to give this medium a go, do your research, learn about the latest trends, and ask the podcast hosts about the data insights they have available. Now that Apple Podcasts, the largest podcast directory, is finally investing in podcast performance insights, and Spotify has acquired the two data-driven podcasting platforms, the future of podcast advertising (and measurement) is brighter than ever. But until these analytics platforms are available for sponsors, we encourage you to take matters into your own hands, set up appropriate tracking, and continue to iterate on the process along the way. The post 4 Effective Metrics For Measuring Podcast Advertising appeared first on Portent. Next PostNext Do You Believe in Your Company's Core Values?